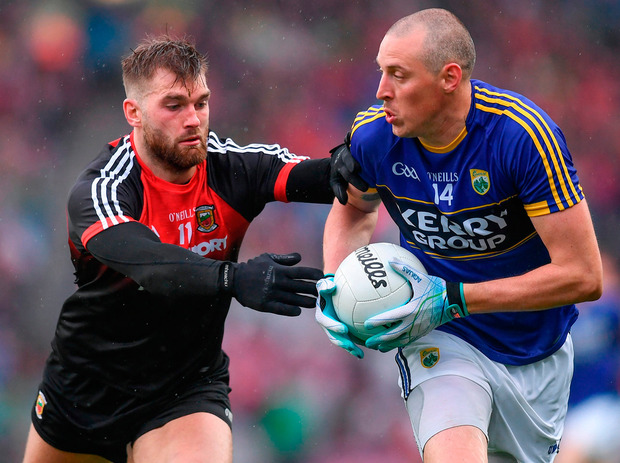 As we watched Aidan O'Shea undergo a crash course in the intricacies of full-back play - overseen by the ultimate task master, Kieran Donaghy - our mind wandered back to two games from the late noughties. First to the 2008 All-Ireland quarter-final between Tyrone and Dublin - another match played against a backdrop of heavens erupting over Croker. Dublin's No 3 was Ross McConnell - a converted midfielder who had spent virtually two full championships in his adopted full-back home. But, even as Dublin retained their vice-grip on Leinster, McConnell's relocation always struck us as an 'experiment' that could blow up in Paul Caffrey's face at any moment. He didn't even start the '08 Leinster final landslide against Wexford, only to be recalled for the quarter-final and a date with Seán Cavanagh. You probably recall the next bit: Tyrone romped home by 12 points with Cavanagh's 26th minute goal arguably the game's key momentum-shift score. Our match report noted: "The big weakness in McConnell's game as a full-back has been a tendency to initially stand off his man and then try to dispossess him. His recall looked risky beforehand, more especially against a player of Cavanagh's gilt-edged quality - and so it transpired." We didn't spare McConnell in our player ratings, although it's worth stressing that this was very much a collective implosion by a team that had reached the end of the line under Pillar. Here's the rub: Ross was a midfielder asked to fill arguably the most specialised position in football. In that sense he was a victim of Dublin's ongoing struggle to unearth a successor to Paddy Christie. Pat Gilroy encountered the very same problem on inheriting the keys to the capital. His initial solution was to reinvent Denis Bastick, who had previously failed to make the midfield cut under Caffrey, as the leftfield answer to Dublin's full-back prayers. And, of course, Dublin marched on to a fifth straight Leinster title with Bastick wearing No 3 for all three rounds. Which was all very well until the team and its still-rookie full-back faced the ultimate barometer - a gloriously gifted heavyweight attack with a king-sized point to prove. Cue the following Herald player rating: "Roasted by the livewire movement of Declan O'Sullivan. Booked after 47 minutes and only lasted 70 because of refereeing leniency after two more blatant yellow card offences." Ouch! Again, it's worth stressing that Bastick should not be seen as the fall-guy for what transpired against Kerry - no more than McConnell against Tyrone in '08, this was a collective collapse on a grand scale. Nor should we ignore what happened in the years that followed, with Bastick returning to midfield haunts and accumulating four Celtic Crosses (and a potential fifth) all in his thirties. What has all of this got to do with Aidan O'Shea and Kieran Donaghy? Quite a lot, in fact. McConnell spent two seasons as a 'stop-gap' full-back and it all ended badly. Bastick had a season's preparation for his inglorious swansong in the role. Curiously, the latter didn't have to deal with Donaghy in all his high-fielding 6'5" glory - 'Star' was recuperating from a metatarsal injury and confined to 'water carrier' duties as his team-mates went to town on Dublin's defence. And maybe Bastick would have been better equipped to handle Donaghy than the slippery O'Sullivan alternative. But this cuts to the heart of the conundrum that Donaghy poses for every rival manager tasked with stopping Kerry. If Kerry go long and high towards Donaghy, and the delivery is on the money, he can be close to unplayable. Just ask Galway last month. Or Mayo in '06. Or Mayo three years ago. The green-and-red's traumatised history in the shadow of 'Star' obviously coloured Stephen Rochford's thinking in the run-up to last Sunday's tumultuous stalemate. If there's two things you can't accuse Rochford of it's (a) a lack of conviction or (b) a play-it-safe mentality. He won't shy away from bold decisions even in the knowledge that he's making a rod for his own back. -The damage last Sunday wasn't remotely so spectacular. -O'Shea wasn't the chief culprit for Kerry's first goal - his brother Seamus was. -His switch to full-back ensured that Kerry tailored their approach and generally avoided route-one missiles into Donaghy's air space. If Mayo had played someone else as his shadow (Donal Vaughan, Ger Cafferkey, even Brendan Harrison) it's entirely conceivable that Kerry would have gone modh díreach more often ... we'll never know if this could have led to one or two Kerry goals of potentially huge impact on the scoreboard and psychology of the match. -For all his previous (all-too-brief) full-back auditions, O'Shea had barely a fortnight to adapt to this most demanding of positions and challenges. -His movement has been flagged as a weakness in the past. Couple this with his understandably suspect positional sense and you have a recipe for trouble against an opponent of Donaghy's game intelligence and oft-underrated ball skills. -By playing him at full-back, O'Shea's impact as a ball-winner around the middle-third or bulldozing attacking threat was rendered null and void. Can they afford to play the same trick next Saturday? We can't see that delivering a positive outcome for Mayo. Their only problem? If O'Shea doesn't play there, who can they actually trust with the job?